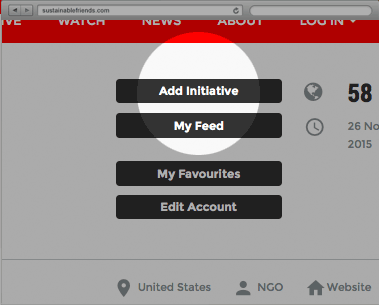 Share information, ideas and change making to inspire people committed to environment. organizations, school projects, companies and stories to help the environment. Share yours and become a Sustainable Friend. Whether you’re a student or a scientist, an individual or part of a group, if the reach of your sustainability work is local or global, helping your community or business based or making people aware about an issue in you neighbourhood, Sustainable Friends is keen to hear about it and help you raise the profile of your contribution to conservation and protecting our environment. 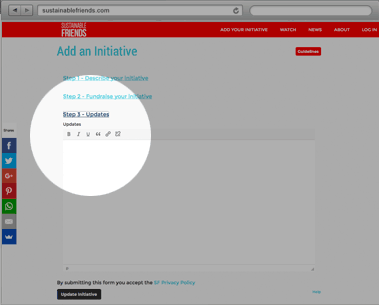 Click "Add initiative" to add your story. Upload images and add the content of your article. Help people find your article: choose a category and set the location. Spread the word. 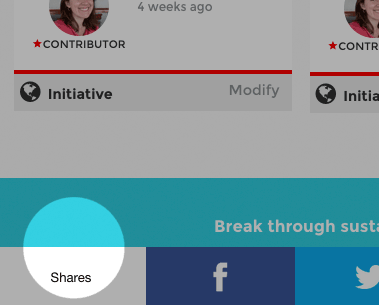 Share your content on social media accounts to increase visibility. This is your opportunity to make an impact on others, engage your contacts and get the attention of influencers. 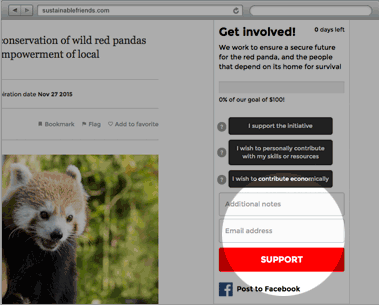 Contributors support and resources are sent directly to your inbox. Update support progress, make changes, post updates and send thank-you notes from your dashboard.